Bold and custom-designed, this squadron of paper airplanes includes models both simple and complex, from a basic glider (a particular favorite with bored children everywhere) to a jet fighter that soars straight and stall-free. The brightly illustrated, innovative, and detailed designs make construction easy for anyone: each part of the plane is tackled, starting with the body and moving on to the tail and wings. Plus, to add to the flying fantasy, there are tips on drag and lift for each one, and instructions on how to perform loops, dives, and other show-off stunts. 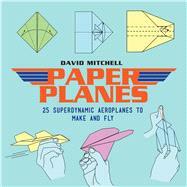 David Mitchell has been fascinated with origami since he was eleven. He is a prolific inventor of original paperfolds, action novelties, and manipulative puzzles. He is the author of many books on specialist aspects of origami, such as Origami (Dover Publications), Sticky Note Origami (Sterling), Mathematical Origami (Tarquin), and Complete Origami (Collins & Brown).